Smart filly Catch Me holds onto favouritism despite drawing an awkward barrier in the 2019 Group 3 $160,000 Ladbrokes Blue Diamond Preview (1000m) for the fillies at Caulfield on Saturday. Catch Me, above, is the favourite for the 2019 Blue Diamond Preview at Caulfield. Photo by Steve Hart. The Team Snowden trained Catch Me drew barrier fourteen in the original draw of sixteen plus two emergencies but with four early scratchings the I Am Imvincible filly has moved into gate eleven. Race eve betting for the Fillies Blue Diamond Preview at Ladbrokes.com.au has Catch Me as the $3.70 favourite ahead of the Lloyd Kennewell trained Jedastar at $4.80 and the favourite’s stablemate Anaheed at $5. 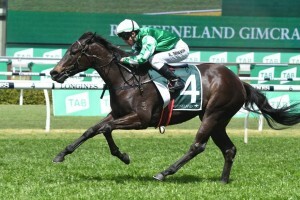 Catch Me was an impressive two and three quarter lengths winner when she debuted in the Group 3 $160,000 Keeneland Gimcrack Stakes (1000m) at Randwick on September 29 and co-trainer Peter Snowden is very happy with the way the filly is shaping up for her return to the race track. “They don’t win like that unless they are above average,” Snowden told AAP. Anaheed was also a debut winner in the $125,000 Victory Vein Plate (1000m) at Randwick in October and is shaping up nicely, winning a 900m Pakenham barrier trial on the same day as Catch Me on January 15. “They both trialled nicely and they’re on track,” Peter Snowden said. Both the Peter and Paul Snowden trained fillies are being aimed towards the Group 1 $1.5m Ladbrokes Blue Diamond Stakes (1200m) at Caulfield on February 23. Melbourne Cup winning jockey Kerrin McEvoy rides Catch Me while Ben Melham will partner Anaheed who has draw in close at gate two.